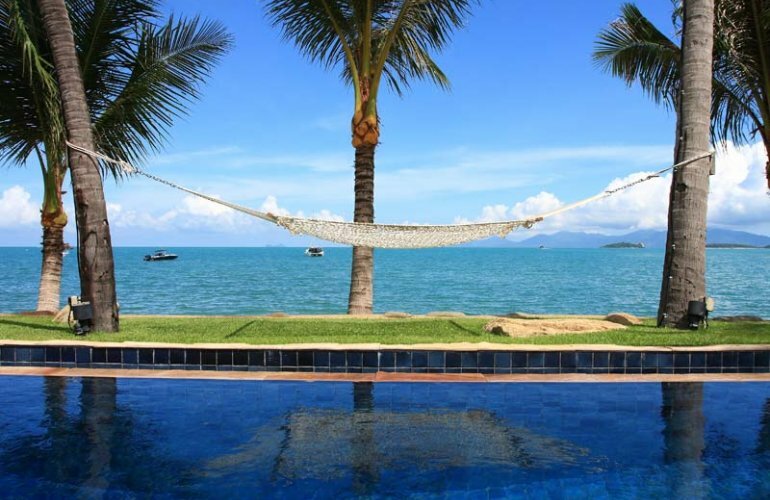 This luxurious beach front villa enjoys spectacular sea views over Big Buddha bay, its famous landmark, the golden Big Buddha and the nearby tropical islands of Koh Som and Koh Phangan. This substantial property is set within a 1600sqm private walled garden and consists of two mirror pavilions with direct access to the white sandy beach, perfect for year round swimming, jogging and stunning sunsets. The pavilions, each with 330sqm of living space areset side by side, both with spectacular sea views. Each pavilion features three air-conditioned bedrooms (two double and one twin bedroom) all with en suite bathrooms. The master bedrooms overlooking the beach have sumptuous bathrooms including a secluded outdoor Balinese bath and shower. A fully fitted Western style kitchen with all modern appliances is set alongside a Thai style outdoor kitchen and adjacent to a spacious dining area with seating for 14, in addition to a relaxing area with a sofa and a large day bed. Outside, enjoy alfresco dining with sea views in a tropical garden setting. The air-conditioned lounge is furnished with comfortable sofas and enjoys fantastic sea views through sliding glass doors towards the Big Buddha. The lounge backs on to an air-conditioned entertainment area with a bar and an AV room equipped with satellite TV/DVD. All the rooms are beautifully furnished and include a range of Thai and South East Asian artworks and accessories. Sliding glass doors from the living, dining area and main bedrooms provide access to the decking area; surrounded by lush vegetation, mature coconut palms and tropical trees. Sophisticated mood lighting and an integrated sound system with an I-pod capable music system provide high quality sound throughout the main living areas. All the bedrooms have DVD/CD music systems and USB access. Broadband Wi-Fi access is available throughout the property. The 12m beachside pool has a sunbathing area equipped with cushioned sun loungers, parasols and a large double hammock spanning two coconut palms. At night the garden and trees illuminate, creating a special atmosphere. The decking and adjacent lawns offer an ideal entertainment area for large gatherings. At the entrance to the property is a covered parking area for up to three vehicles. There is a first floor air-conditioned gym with sea views, equipped with cross trainer, bicycle and weights. Adjacent to the gym is the seventh bedroom with twin beds and bathroom. The villa is a perfect choice for family gatherings or groups of up to 12 adults. The three resident staff includes a qualified Thai Chef who will prepare candle-lit beach- side dinners, garden barbeques or a stylish indoor dinner party for family and friends. For something different take a short stroll along the beach for an eclectic range of restaurants and bars.